There’s a book that sat on my uncle’s shelf for years—an evocative, now-obscure memoir, published in 1939, by a French airline pilot. Reading it, I finally learned the inspiration behind the themes of Expo 67, Canada’s famous world’s fair, held fifty years ago, in Montreal. In Terre des hommes (published in English as Wind, Sand, and Stars), Antoine de Saint-Exupéry told of flying the mail between France, Africa, and South America in rickety, propeller-driven airplanes, while also laying out a philosophy of life. He dedicated the English version of the book “to the Airline Pilots of America and their Dead.” In a tragic turn, Saint-Exupéry himself disappeared during a reconnaissance mission, near the end of the Second World War. Saint-Exupéry might be forgotten today but for The Little Prince, his 1943 novella and one of the best selling books ever written. In it, a chapter from Terre des hommes—the true story of Saint-Exupéry’s crash in the Sahara Desert while flying from Paris to Saigon—is adapted into a magical, child-friendly philosophical treatise. An airman, lost and thirsty in an ocean of sand, stumbles upon a boy who has left his home on a small asteroid to explore the universe. The pilot is stirred by the child’s understanding of life and their shared, deep solitude. In Terre des hommes, Saint-Exupéry has much to say about the magic of flying, but it was his observations of the planet below that drew the attention of a group of Canadians who, in the early nineteen-sixties, were trying to set the mood of Expo 67. My own life has crossed paths, in different ways, with several of these characters: I interviewed Davidson Dunton, the one-time president of Carleton University, which I attended, and the scientist John Tuzo Wilson, famous for contributing to the theory of continental drift; I lived on the Montreal street named for Wilder Penfield, the McGill University neurosurgeon and a friend of friends; and my spouse taught at Gabrielle Roy, a Toronto school named for the French Canadian novelist. Saint-Exupéry and his navigator were rescued from their real-life Sahara crash by a Libyan Bedouin, whom the author thanks in Terre des hommes, as he makes a plea for human solidarity. The book was published at the outbreak of the Second World War. Saint-Exupéry, wrote Roy, “found a phrase to express his anguish and his hope that was as simple as it was rich in meaning.” It was the idea that we shared one earth and should try to get along: terre des hommes. Man and his world. The Expo group took up Saint-Exupéry’s theme of human solidarity, and used his book’s title as the fair’s slogan. It was as if Saint-Exupéry “were speaking directly to the truck-driver, the ditchdigger or, better still, the mason,” Roy reflected, alluding to man—we would now say “humans,” or something similarly inclusive, in all these instances—as builder, creator, and steward of the planet and the civilization he had created. My brother, Jeffrey, two years older, kept an Expo scrapbook as a class project (for which he received a decent mark of sixteen out of twenty), and unwittingly created a valuable future resource. It is one thing to say in hindsight that opening day was magic. It’s quite another to be able to prove it. 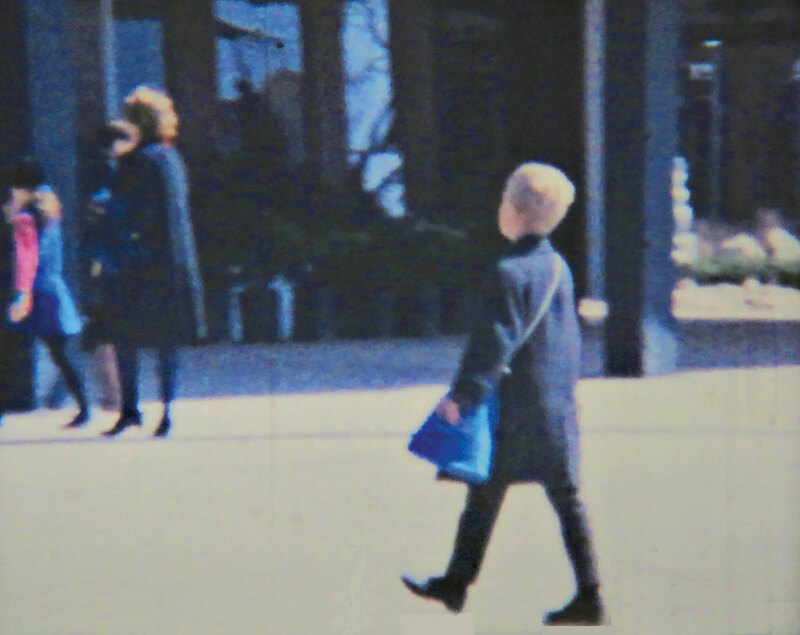 A few days after Expo’s debut, Jeffrey wrote to our maternal grandmother about it, and I am astonished, fifty years later, to be able to walk with my family through Expo on Day 1. Jeff described how we zoomed “past the Habitat Station, past place des nations,” en route to La Ronde; how we “boarded the minirail, a ride carrying you forty feet high and even through pavions”; and how, at the Île Notre-Dame Expo-Express station, “we had a discussion. After having a vote we entered the Western Provinces Pavilion,” in which “we descended into a mine. Here we saw different Rocks mined in Brtish Columbia. After manuvering a sharp bend looking at an Atomic Energy station we took a look at a tipicle wheat farm in the wheat-growing provinces of Alberta, Saskatchwan and Manitoba. Suddenly we entered a roofless room in which a giant log truck and real trees had been planted.” I recall there lingered a scent from what the official Expo guide referred to as “lofty Douglas firs,” even a forest-y dampness, helped by cool weather in Montreal. On postcards, the firs are seen poking out the top of the shingled structure. It was a packed afternoon. We ended up at the Ontario pavilion, a many-angled, origami-like canopy, and where Lake Erie perch was served in one of the restaurants. Things quickly got more technological. Jeff was impressed by a series of robots “representing M. Busnessman, Mr. Sports, Miss. Arts, Miss. Science,” who put on “a marvolous mecanical play.” But something else blew us away even more: “We were told that a rare film was to start in two minutes,” my brother wrote. “This film turned out to be the only one like it in the world . . . in which different pictures flash on a screen and suddenly turn into one, change and split up again.” That would have been A Place to Stand, with its score “A place to stand / A place to grow / Ontar-i-ar-i-ar-i-o,” another earworm of the day, and from then on an anthem—perhaps the cheeriest ever penned—for the province. The movie’s innovative multi-dynamic image technique helped win it an Academy Award, in 1968, for best live-action short subject. We would visit Expo often, all summer. I’d look from the parking lot, through the iron beams of Montreal’s blackened, rusty nineteenth-century Victoria Bridge, across to Buckminster Fuller’s geodesic dome, shimmering blue-green in the distance, or Katimavik, the upside-down pyramid, on Île Notre-Dame. This was my world, I thought, and although Expo came and went, in many ways it has remained my vital happy place ever since. In Montreal, in the nineteen-sixties, young children walked to school alone and wandered unsupervised around their neighbourhoods. My brother, my cousins, and I were similarly free-range at Expo. We were inclined to go to La Ronde, the amusement area, but once let loose, we headed for where it was really at: film screens. Expo stood as the prototype for the virtual, electronic future predicted by the media guru Marshall McLuhan. The pyrotechnic virtuosity on-screen grabbed your attention and would not let go. Many films were torqued to the limit, using the technologies of the day: multi-screen; cruciforms with images ahead, above, and below; audiences seated on carousels. The Canadian paint and chemical industry’s Kaleidscope pavilion was called by one critic, “a prismatic environment of reflecting mirrors with filmed images of bleeding, bursting colors . . . the ultimate psychedelic experience”—a very sixties, McLuhanesque way to push paint. The queue to see the National Film Board of Canada’s multi-screen, multi-chamber In the Labyrinth was so long it snaked right out into the St. Lawrence River, at least as seen in a newspaper editorial cartoon of the day. Thanks to the very type of media McLuhan foresaw—namely, virtual reality—my mom and I finally got to see the film this summer, at the Stewart Museum. We were seated in womb-like white plastic chairs, as a young man whose parents, even, might not have yet been born in 1967, helped us on with our goggles. Into the labyrinth we went, finally seeing what the fuss was about fifty years ago. There is one Expo film that wasn’t very fancy. Like many films at the fair, the equipment needed to play it isn’t as easy to find anymore. It was the home movie made by my family. 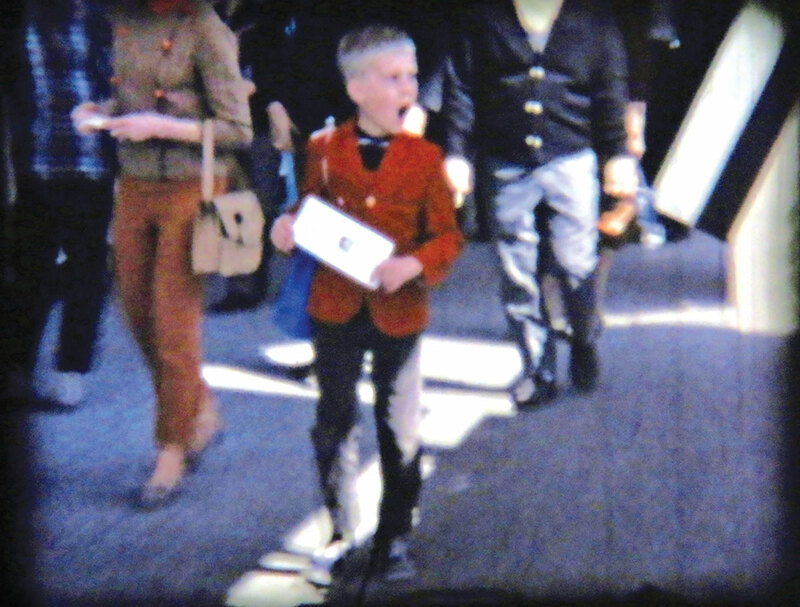 There we are on eight-millimetre film: my mother, my brother, and me (Dad is the cinematographer), ready troopers arriving at Place d’Acceuil, the fair’s entrance. I appear on the platform waiting for the Expo-Express. When it arrives, my father follows me in, camera running, and off we go. 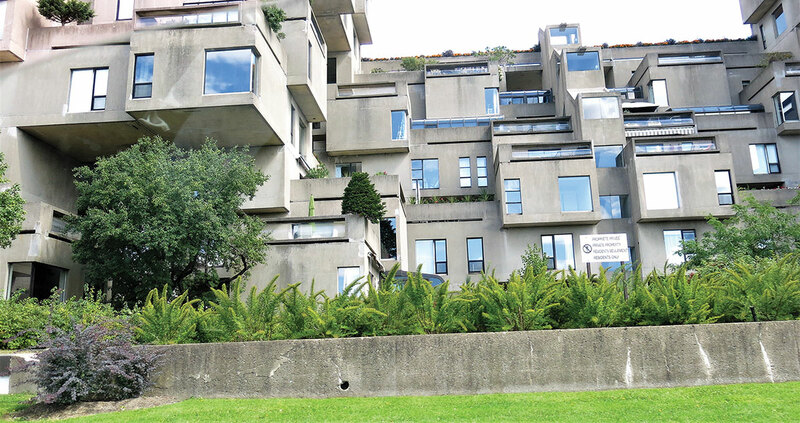 Looking past my bobbing head, you see us zip past the architect Arthur Erickson’s Man in the Community pavilion (fashioned from what seem like giant Popsicle sticks), past Habitat 67, the model housing complex. In a moment, we are crossing the new Concordia Bridge to St. Helen’s Island. My dad pans across the unfolding scene: On the left, the ball of Fuller’s American pavilion. More distant, out on Île Notre-Dame, rises Katimavik, the centrepiece of the Canadian pavilion. Its aqua colour is still visible in the faded footage, shown dozens and dozens of times at family get-togethers over the past half century. 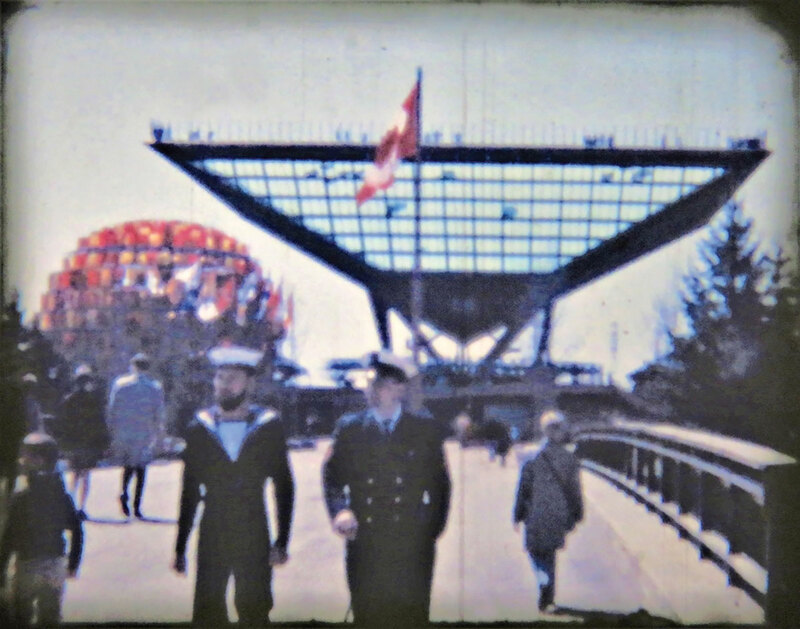 I am seen on a different day, in my red blazer, yawning, in the massive Soviet pavilion, which displayed such doomed technologies as the Tu-144 supersonic jetliner. In another scene I wave frantically for my dad to hurry up, before disappearing into British Hovercraft Corporation’s experimental hovercraft service, which would take us for a spin up the rapids, through Le Moyne Channel, separating the Soviet and U.S. pavilions. In my overcoat—this scene must have been early, or late, in Expo’s six-month run—I walk up to an animated sculpture that caught my cameraman’s eye. 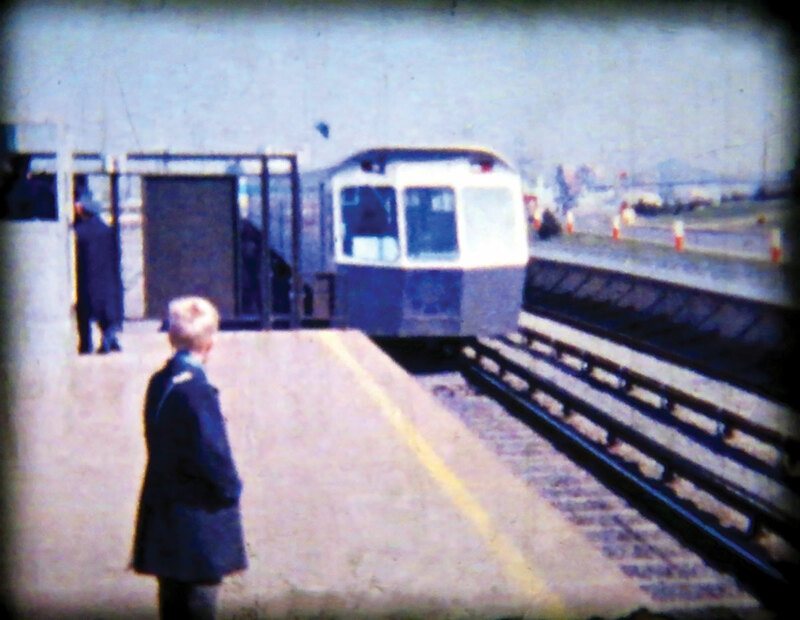 My dad lets the film run, as rotating rings show a jumble of moving colours. They slow down, and I look satisfied as the shapes come to a stop, aligned as a pop art play on Da Vinci’s Vitruvian Man. In one scene, my older, calmer brother looks out at the St. Lawrence, from the patio at the Ontario pavilion. I show my impish side at Vermont, where I follow my family up a ramp, then walk backwards straight back down, knowing on playback the film will seem to have reversed. Outside Belgium, Dad hands me the camera and everything goes shaky, but Dad smiles as he walks toward me, wearing a suit over his argyle sweater vest. In a bit of trick photography, I am seated, with my blue Expo 67 tote bag, on the edge of a precipice. Foreshortening by the camera makes it appear I can reach out and touch the passengers, not to mention the track and electrical gear, on a passing Minirail. Over at La Ronde, La Spirale rotates up its giant pole. Voyageurs paddle a giant canoe on Lac des Dauphins. A man flying on a Canadian flag hang-glider soars behind a motorboat. Finally, I look pensive, exhausted on a replica of Jacques Cartier’s Grande Hermine, the ship he sailed to North America, in 1535. A gondola ride whisks us back to the more serious part of Expo. In the age of digital video, when any smartphone can produce sharp, instant moving pictures, it is hard to imagine the trouble and expense involved in 1967 to create such fuzzy, flickering memories. A four-minute roll of unexposed film cost about three dollars—the equivalent of twenty-two dollars in 2017. The better Kodachrome stock cost even more. Cameras were finicky, mistakes many. Projectors were hard to thread and often jammed, and the heat of the lamp could melt the film. Ambitious parents edited scenes together, but many families didn’t bother, showing the reels exactly as they were returned from the processor. Our film has at least one Expo-worthy special effect: a double exposure my dad left in of a trip to Vermont the following winter. Skiing at Expo we call the error, where family members are seen disappearing down ski trails at Smuggler’s Notch, darting between moving Minirail trains, ghosts schussing through such impediments as the French pavilion. Scenes of young Alfred at Expo, from the Holden family’s home movies. In 2007, I contributed to Concrete Toronto, an anthology of essays on mid-century concrete architecture, published by Coach House Books. At the launch party I rubbed up with a friendly gentleman, also a contributor to the anthology and, as I found out, the architect of an artful addition to Toronto’s Central Technical high school. “A Place to Stand” began to play in my head. Several years earlier, my spouse and I lived in one of Toronto’s early Modernist apartment houses: 169 St. George Street, built in 1958, and designed by James Crang and George Boake. Boake was in the Toronto phone book, so I invited him over to have tea and sit in one of his corner windows. It’s cool to live in a building and ask its architect, as he eats your cookies, what he was thinking. A lot depends on the client, Boake said. “There didn’t seem to be a lot of interference, if you like” at 169. Then he told me client input was considerable for the pavilion his firm designed for Air Canada at Expo, its most prominent feature a spiral stairway to the sky, suggesting the circle of fins in a jet engine. That was the thing about Expo: my childhood happy place kept turning up in my adulthood, saying hello, with life-affirming regularity. I recall visiting an apartment low in the jumble, with ultramodern furniture, a garden, and views of the river. At the far end, nearer the point of Cité du Havre, one of the concrete boxes was suspended all summer from a crane. Around it were moulds and equipment showing how they were made—a fortuitous display, the result of Habitat being not quite finished by the time of Expo. 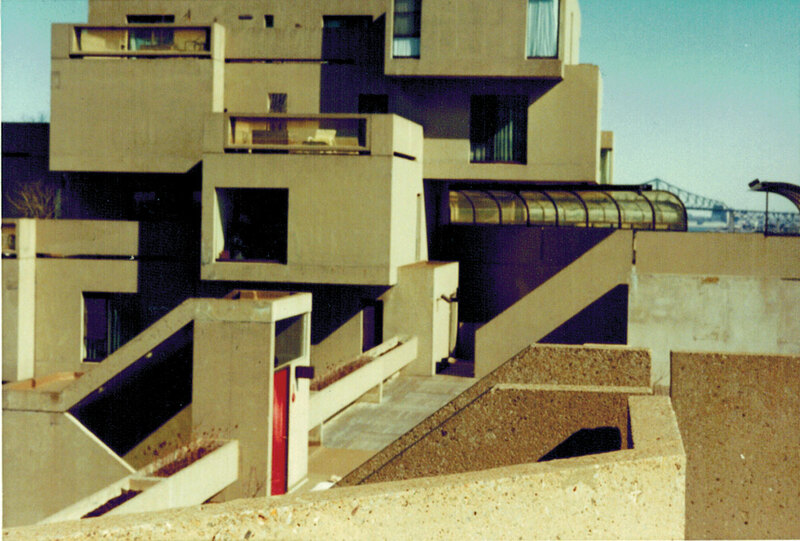 My interest in Habitat turned a page in 1971, when Karl Raab, the son of friends of my maternal grandparents, moved from Vermont to Montreal, taking a sublet on Apartment 615, midway up the pile. Here was my chance to visit and stay at Habitat often, sleeping in one of the Raabs’ heirloom Biedermeier beds. Our extended family gathered at Karl’s apartment in June of 1972 to see Grandma off to Europe on the Soviet ocean liner M.S. Mikhail Lermontov, whose sister ship, the M.S. Aleksandr Pushkin, of the Baltic Sea Shipping Company, was where the Soviet Union had signed its deal to participate in Expo. One picture shows me, sporting an Andy Warhol hairdo, standing with family on the Lermontov’s stern, Habitat behind us. In another, we switch, and watch from the terrace of Apartment 615 as tugboats pull the liner, Grandma safely aboard, from its slip, and it departs down the river. 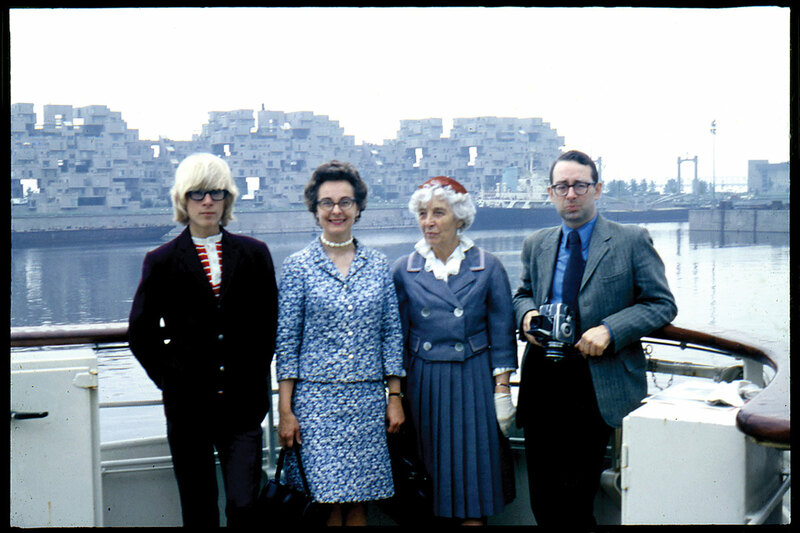 Alfred Holden, Sylvia Holden, Erna Heininger, and Oskar Heininger, aboard the M.S. Mikhail Lermontov, 1972. Slides show our family visiting Habitat. Here we are in the nineteen-seventies, picnicking on the patio. There is Eveline Bradter, Karl’s wife (whom he met on the Expo site), on the patio, being stung by bee. She is next to the tomato plants that prospered in the architect Moshe Safdie’s centrally irrigated balcony planters. The Raabs’ unit contained the famous two-piece molded fibreglass bathroom—tub, sink, ceiling, and floor all one prefab unit, everything but the toilet, which was bolted to the wall. The apartment also had a General Motors Frigidaire kitchen, elegantly modern, with grey cabinets framed in aluminum. I loved Habitat so much, my instinct was to move in. In another instance of Expo resurfacing in my life, I almost did. I was twenty in 1978 when Eveline, who worked in the German Foreign Office, was transferred to Vancouver. Between us we conceived a scheme to hold onto Apartment 615 by subletting it, but the deadline to give notice to Habitat’s owner, Canada Mortgage and Housing, passed before we found a tenant. A few years later, the government of Prime Minister Brian Mulroney sold Habitat, for ten million dollars, to Pierre Heafey, a Quebec businessman, who flipped it to residents for $11.4 million. Could we have bought 615, now a condo? By the mid-eighties I was established in the workforce; the Raabs owned a house in Vancouver, but were living in Europe. Maybe. “It was a feasible plan,” Karl said recently, on the phone from Vancouver. “It could have worked out,” I said. In 1981, after I graduated from university and moved to Toronto, I noticed Expo 67 street furniture scattered around the city, specifically the fair’s distinctive park benches. There were several in Queen’s Park, and a few in the Beaches. Some deluxe ones, with backs, lined the tiny Frank Stollery Parkette, at Yonge Street and Davenport Road. Fourteen years after Expo, I thought myself to be one of few people who knew or cared about the history behind them. During the summer of 1967, my mother noted discrete plaques attached to the avant-garde furniture throughout the Expo site. The signs indicated the benches were Toronto’s offering to the fair. They were part of an ensemble that included matching triangular trash cans, broad white disk-shaped street lamps that reflected light projected from below, and bubble phone booths, all custom made, and credited to the designer Luis Villa. This didn’t much please the Toronto designer Paul Arthur, who created Expo’s much-acclaimed signage, and who originally held the furniture contract. 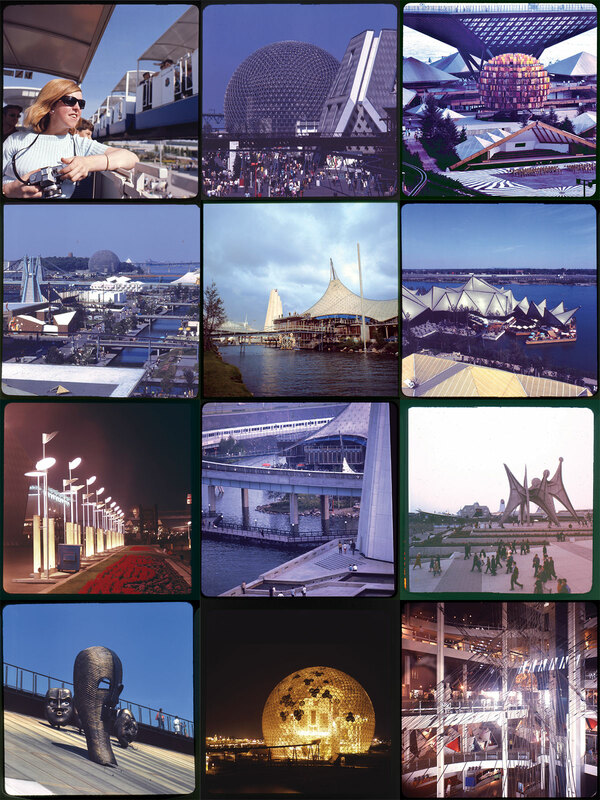 It seemed logical that Saint-Exupérian sentiments about human interdependence, McLuhanesque notions of a global village, or maybe even Jane Jacobsian expressions of friendly urbanity would be behind Toronto’s Expo benches—but was it so? As a Torontonian now, I was curious. In some old city council minutes, I came across a mention, along with the name of an Ontario Expo official named Allan Rowan-Legg. One evening I called him up. Rowan-Legg was one of the lieutenants on the Expo team in Toronto, whose responsibilities included Macy DuBois’s pavilion. He said he’d been given a floor in Toronto’s then new city hall, to drum up interest and Ontario exhibits. At the time, Expo benches could still be found in parks around Toronto. I know of none remaining today. 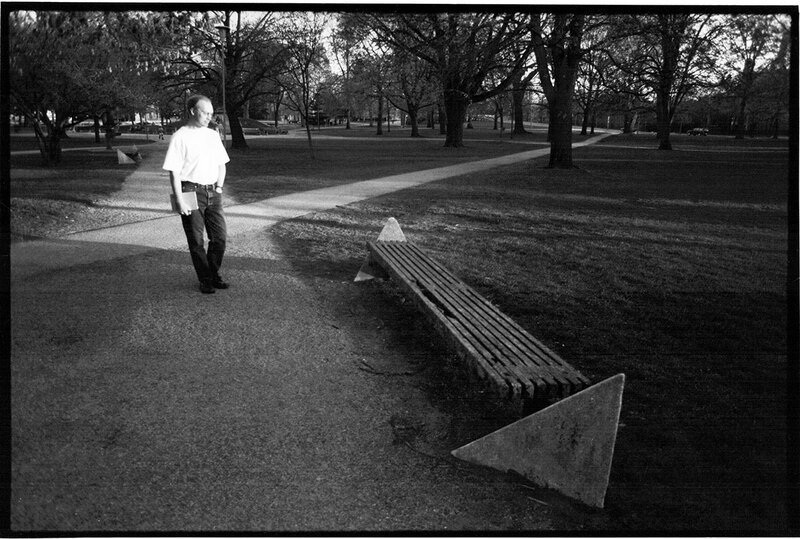 Alfred admires Expo benches in Toronto’s Queen’s Park, 1997. Expo was still going full tilt on Labour Day, 1967, when my family moved to Ottawa. My dad had taken a job at Parks Canada, and we purchased a house in the Glebe. Back in Pointe-Claire, 110 Douglas Shand was sold, with the closing at summer’s end, giving us and family visiting from the United States some more time at Expo. After the move, we commuted by Volkswagen from Ottawa. In my dad’s Expo Passport—the season passes fairgoers had stamped at each pavilion they visited—he noted “26/10/67,” two days before the fair closed, and the last day the Holdens were there. 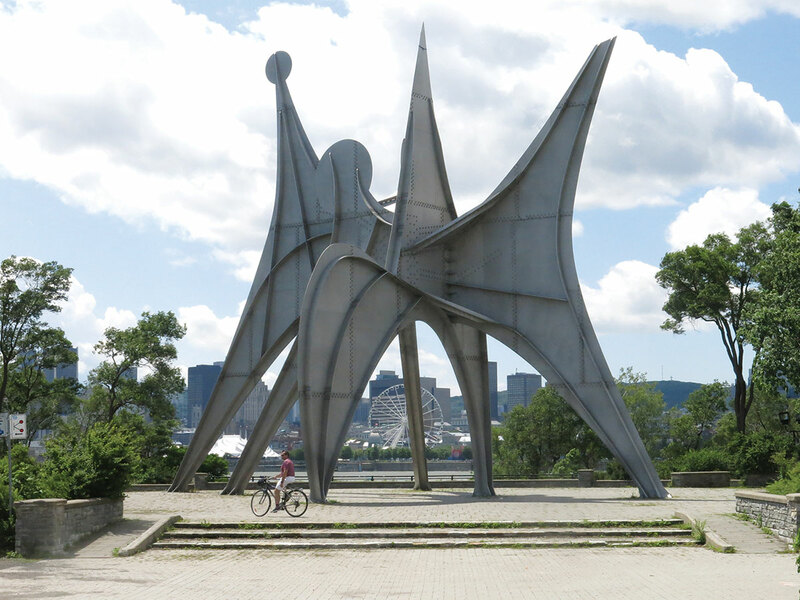 This past August, my spouse and I took our bikes to Montreal and did the grand tour of what is now Parc Jean-Drapeau, the former Expo islands. Its symbol is Julien Hébert’s globe of stick men. We had to laugh when, cycling way out on one of the narrow strips of fill in the river, we ran into the short-lived black gnats that gather in extended clouds along the St. Lawrence, whom officials prior to Expo went after with the best insecticide they could find—dichlorodiphenyltrichlorethan, or D.D.T. Remnants of Expo abounded. On St. Helen’s Island, we passed through the sculpture park that was a lively part of the Expo art scene. Some pieces remain, unsung in the maturing forest, while others are sprinkled about the islands. They include, on St. Helen’s, Alexander Calder’s Man, moved from its original site. We passed the geodesic frame of Fuller’s dome, as a security guard in a Jeep kept watch. A fire in 1975 destroyed the plastic enclosure, but the structure of metal tetrahedrons looks sharp just the same. The Canadian flag was flying inside, where the Montreal Biosphère environmental museum has long occupied the complex. Over on Île Notre-Dame—past Trinidad’s tiny pavilion, lonely amid maturing conifers, past France, past Quebec’s mirrored box, now playing support for the casino—Katimavik is three decades gone. More earthbound sections of the Canadian complex remain, serving as park headquarters. We ran into a wedding party looking for La Toundra, the Canadian pavilion’s Inuit-themed restaurant, where apparently they were expected. Calder’s Man and Habitat, in 2017.